Loveland started making snow on September 21, 2009. "We took advantage of the cold temperatures and got an early start making snow this year. Those extra days paid off and we are opening a week earlier than last season," said Eric Johnstone, Snowmaking and Trail Maintenance Manager. "Now we can move some equipment to other trails and try to open more terrain as quickly as possible." "We are proud of our snowmaking crew and extremely excited to offer the first skiing and snowboarding in Colorado and North America," said Rob Goodell, Director of Business Operations. 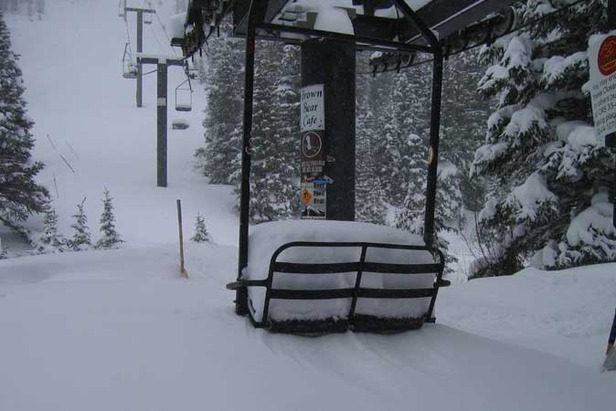 "Skiers and riders have been waiting all summer for this day and we are anxious to fire up the lifts. We are opening a week earlier than last year but the coverage is great! We will open with an 18" base and tree to tree coverage on our opening day run." For the first turns of the season, skiers and snowboarders will have access to a top to bottom run consisting of 1,000 vertical feet via Chair 1. The trails Catwalk, Mambo and Homerun make up this opening day run which is over a mile in length. Elsewhere other resorts across North America and Europe have reported fresh snow falling, building anticipation for the coming winter. Loveland's neighbour Copper Mountain has begun snowmaking and the preliminary stages of its new superpipe are being laid in place ahead of their scheduled November 6th opening. North of the border new snow has been reported at Banff and Whistler.